Decadent Biscotti and the over indulgent person! Well how bad can that be? 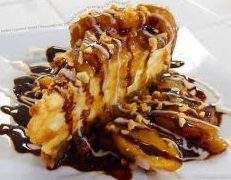 When you think of "Decadent" what comes to your mind? 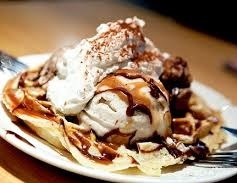 Is it an over indulgent Ice Cream Sunday? Maybe it's a triple disgusting piece of Cheesecake! OR? 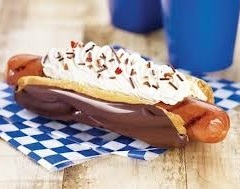 Is it the ultimate in revulsion, a Chocolate and Wiped Cream Hot Dog? So what does decadent mean? having low morals and a great love of pleasure, money, fame, etc. But what does that mean when applied to the culinary world? I think it's more 'tongue in cheek' that the person eating it runs the risk of being decadent as it is 'too good a luxury' or way beyond most people's ordinary means. It isn't necessarily used to describe "good" food, but rather to describe food that is rich or loaded with calories or carbs or sugar or is somehow not really the best choice in food, i.e. unhealthy. Decadent not only means decaying or degrading, but it also means marked by or providing unrestrained gratification; self-indulgent. So, if you choose to eat a double fudge brownie, a scoop of rich, fattening ice cream on it, topped with hot fudge, THAT could be called "decadent," because you're being very indulgent. Food that is Soooo good it's bad! Under this category we will cover a couple of different types of Decadent Biscotti* that fill this bill. *Some of which are still under development. We all love the taste our favorite store-bought candy bars, but if you don't love the cost and all the mystery ingredients, then these are worth a try. 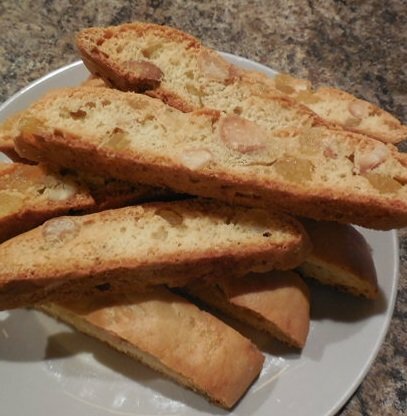 With the right ingredients and a little time, you can make dozens of Biscotti that mimic your favorite candy bar, in your own kitchen. 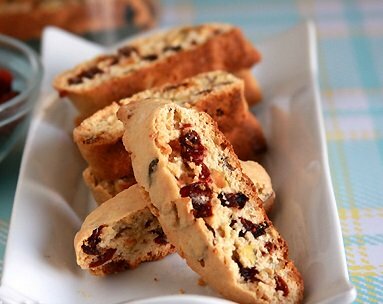 These Homemade Candy Biscotti are fresh, delicious, and make amazing gifts. Try making your own today! "Double this and triple thats" Biscotti. We all love certain tastes like peanut butter, peanut butter and chocolate, nuts and any kind of chocolate or chocolate and chocolate. But what if you found something that intensified the flavor, buy somehow incorporating more of the flavor you love. Like triple chocolate biscotti, that has a chocolate dough, with chocolate chips, that is then dipped in chocolate. 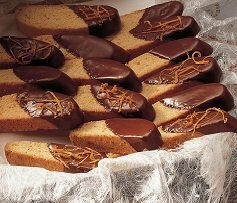 Or how about a nut biscotti first dipped in caramel and then dipped in chocolate. Well you are in the right place if you are looking for such indulgence. Sorry most of the recipes are still under development, when baked and tested they will be posted, so check back soon.